Looking for a room with a balcony in Hungary? Or a hammock in Laos? 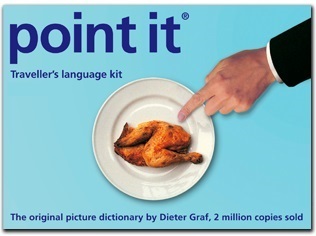 Nobody understands you - that's where picture dictionary point it® can help. This passport-sized book offers about 1,300 photographed items to point at. Allowing you to be understood anywhere in the world. Without words and waving about. You may be fluent in four languages but sometimes you could find yourself "off the beaten track" where you can't communicate. point it®, with 1300 items to which you can indicate, is the answer. Everyone in the world will understand you. This passport-sized assistant is used not only by tourists but also by UN peacekeeping forces, Olympic athletes and speech therapists. The book is the result of the author's extensive travels in the five continents. This series offers more than 220 walking trails on the Aegean Islands. The six volumes describe 46 islands of the Cyclades and the Dodecanese. With detailed maps, exact times, GPS-points and photos of outstanding places for better orientation. Available in English, one edition in French and one in Dutch. The series is made for island hoppers who want to drift through the island world by ship and who would also like to hike and swim in this ancient cultural landscape. Ten to twelve islands, among them very small ones, are described in four of the books. The walks are carefully selected so that places of cultural significance as well as lonesome beaches can be found along the way. Exploring the remaining ancient mule tracks and marble plated roads make the walks especially enjoyable. Each walk is characterized by a precise and plain text as well as a detailed map. Six to four photos of distinctive places allow for orientation along the way, precise split times are given to check. Cultural information complete the picture of each walk. Shortcuts of longer walks and alternative routes for a second hike are described. 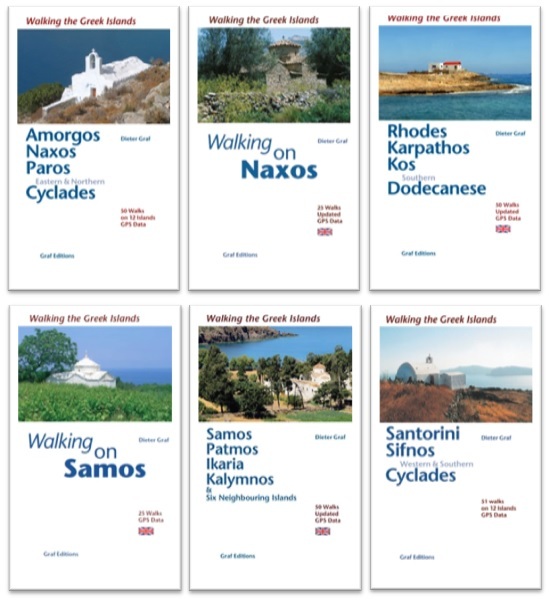 The series Walking on Greek Islands distinguishes itself from other guidebooks mainly in the very detailed route descriptions, with great importance being attached to the map of walks. They are nevertheless concise and fit into the pocket. The author Dieter Graf is an enthusiast for walking in Greece and has known the islands since the 1970s. From that, this series arose since 1999.